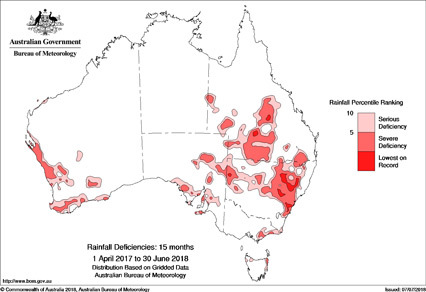 The public appeal will raise funds to provide resources to churches in North and Western New South Wales, which are already dealing with requests for practical support for families impacted by what, in many places, is the worst drought since 1900. It has now been announced that the entire state of New South Wales is officially in drought and although the New South Wales government has launched an assistance package for farmers, the Vicar-General of the Armidale Diocese, the Rev Brian Kirk says "the suddenness of this drought has caught many by surprise." Mr Kirk says any help will be much appreciated by rural families. He particularly has asked Christians to pray for rain, for farming families and businesses in rural communities, for farmers to make wise decisions and that Christians will not lose their faith in God. Mr Kirk says clergy and church members are proactively offering assistance to farming families by providing food and clothing vouchers and visiting to provide practical and pastoral support. Among the practical assistance is free labour to assist with the feeding of stock, maintenance and everyday chores as well as providing free drought dinners. Funds donated through the Anglican Aid appeal will be disbursed through the Anglican Dioceses of Armidale and Bathurst which cover much of the most heavily drought-affected areas. Archbishop Davies has endorsed the appeal with a letter to churches across Sydney. Our heavenly Father, we acknowledge our ingratitude when we have taken your goodness for granted, when the heaven has poured forth rain and the earth has produced its fruit. Yet now we cry to you for help, as the drought in New South Wales deepens. Have mercy on our land; have mercy on the people of the land. May your bountiful hand send forth rain upon our parched earth. Fulfil your promises that while the earth remains, seedtime and harvest shall not cease, so that those in remote and rural areas may find relief from their distress and glorify your name for the provision of their needs. We ask this in the name of our Saviour, Jesus Christ. Amen.